A fillet cut of wild-caught Alaskan salmon. Salmon get their rich pink-red color from the fat-soluble carotenoids (a powerful antioxidant) from the crustaceans they eat. These fish also have high levels of EPA- a fatty acid of the omega-3 family that is crucial for healthy cell function. Salmon is a great source of Vitamins A, B and D and contains important minerals like iron and selenium. Salmon Varieties: Atlantic salmon accounts for nearly 1/4 of all salmon produced commercially. Aquafarms- particularly in Scotland, Canada and Norway- grow the salmon to ship worldwide. Wild Atlantic salmon is a rare commodity. King salmon, also called Chinook, are from the Pacific. This breed of salmon is typically marketed by the river from where they are caught (such as Yukon or Copper Chinook salmon). 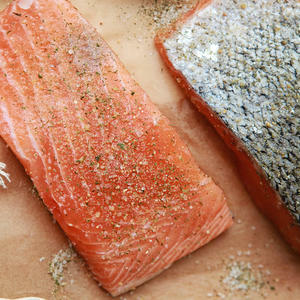 Coho or silver salmon are made available both farmed and wild. Pink, sockeye, and blueback salmon, among others, are often canned. Preparation: From broiling or grilling to baking or poaching, a multitude of different cooking methods can be applied to salmon. Frying is discouraged because salmon is so high in fat. Gravlax is a popular dish of salmon that has been cured with dill, sugar and salt. Lox, a great bagel pairing, is the result of salmon that has been cured in a salt-brine before it is cold-smoked. Nova is another cold-smoked salmon that is less salty. Seafood Sustainability: Certain species of salmon are more at risk for becoming overcaught or obsolete than others. Check the status of a particular fish's abundance by visiting the Seafood Watch list. More information about seafood sustainability can be found here: Keeping Seafood Sustainable.